Plans to make Formula 1 cars faster for 2017 are being watered down following an intervention from Pirelli. Rule changes, including making cars wider and more dramatic-looking, had targeted a lap-time gain of five seconds. But F1's tyre supplier Pirelli told teams its tyres could not cope with the planned increase in cornering forces without making them much more resilient, and therefore slower. Teams are now investigating the effect of a revised series of changes with a smaller increase in aerodynamic downforce. That work is ongoing, but leading engineers predict the cars will now be more like three seconds a lap faster. 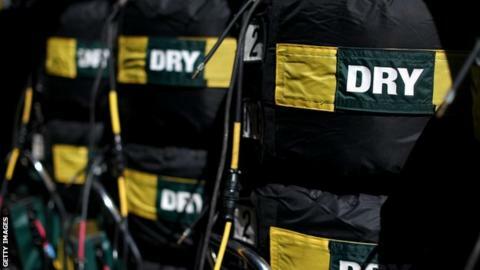 Pirelli told BBC Sport the data it presented to teams was based on calculations at an early stage in the process of defining the tyres for 2017. F1's bosses decided last year to make the cars more exciting and dramatic-looking in response to concerns that the sport's appeal is waning. produce more aerodynamic downforce from wider bodywork and a re-designed underfloor. The increase in downforce predicted from these plans is estimated at between 25-60%. Sources say Pirelli made a presentation to the teams in which it said its tyres, made to the planned 2017 dimensions, could not cope with more than a 10-15% increase in downforce without it needing to impose much higher tyre pressures. It said pressures would have to be as high as 27psi - about 50% higher than would be considered by teams to be 'normal'. But higher tyre pressure reduces grip, which would mean diminishing returns from the increase in car performance. The other problem was that with reduced tyre grip, a greater proportion of the lap-time gain would come from aerodynamics, and the feeling among engineers and world governing body the FIA was that this would make close racing and overtaking even more difficult than it already is. This is counter to the initial intent behind the changes, which was to speed up the cars without having a detrimental effect on the quality of the racing. A Pirelli spokesman said: "With the new tyre sizes proposed for 2017, we think the load capacity of a tyre built to the current construction would increase by about 10%. But nobody knows what structure we will choose for 2017 yet. "Everything will be calculated much more carefully when we start testing." He added that one of the problems was that Pirelli was forbidden by F1's rules from doing on-track testing before 2017, and there was still no agreement on a resolution to that problem. Not all the teams supported the proposal to revise the new rules - the vote was eight in favour and three against among the 11 teams. But that was felt to be a significant enough majority to press ahead. The FIA asked teams to investigate the effect of abandoning two key elements of the new rules package which had been aimed at increasing downforce - a redesigned underfloor and introduction of wider bodywork. Plans to widen the gap between the tyres, revise the size and shape of the front and rear wings and fit bigger tyres remain, however. A senior insider said the target speed increase for 2017 could not be confirmed until the completion of research into the revised plans. The aim is to finalise a new set of rules before the start of the new season in March. Hasn't this come up already? The development comes after world champions Mercedes raised concerns towards the end of last season about the 2017 rules, questioning whether the tyres would be able to cope with the increased loads. Among other issues, Mercedes pointed out that current F1 cars are approaching historic highs in terms of downforce and power and that, if the sport pressed ahead, Pirelli would have to deal with loads to which no other racing tyre has ever been subjected. Mercedes' rivals rejected their concerns at the time, many saying that the team were trying to protect their competitive advantage by keeping rules stable. Is there a wider issue? There is concern in some quarters that the limitations of the tyres will undermine the aims of the new rules and lead to a lot of expensive research into new car designs for little effect. As a result of this, there was a proposal to abandon the whole process of changing the cars fundamentally for 2017, or to just keep the wider track but change nothing else. This was rejected by the wider group of teams. Pirelli said: "Maybe a totally brand new tyre can be built. There is a lot of speculation about this process, but it is still at a very early stage." The spokesman added that Pirelli thought a five-second reduction in lap times was "too much", and that four seconds was more appropriate. The rule changes for 2017 are being formulated at the same time as the road car manufacturers in F1 are trying to come up with revisions to the engine rules to satisfy a request from the FIA for power units to be cheaper, simpler, noisier and more widely available to teams. The manufacturers have to finalise proposals by 15 January. BBC Sport has learned that a bid to drop the MGU-H, the part of the hybrid system that regenerates energy from the turbocharger, has been rejected and that the proposal will be for the hybrid system to remain part of the same design as it is now. However, the idea is for a lot of other parts of the engine to be made standard to reduce costs. The target is for the price of engines for customer teams to be 10m euros (£7.5m) in 2018, when the changes will be introduced. Power units currently cost customers in the region of 18-23m euros a season.